"The shorte can sit on a table that measures as small as 14” deep and 28” wide. These are just a few words that describe why many people avoid quilting with their embroidery machine: Daunting. Frustrating. Awkward. The challenges abound! 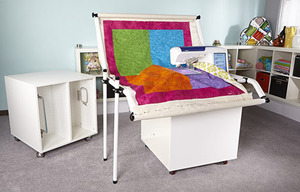 Easily create one-of-a-kind quilts using the patent pending shortE quilt frame system. 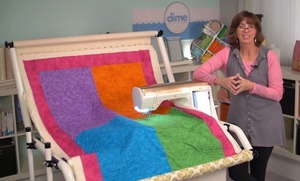 The compact frame design works with a single needle embroidery machine to hold bulky quilts out of the way. The shortE is designed to work in tandem with the Snap Hoop Monster for quick and simple re-hooping right under the needle. With shortE holding the weight of the quilt and Snap Hoop Monster creating the tension, quilting large quilts with a single needle machine is a breeze. shortE takes up minimal space, requires no special furniture and accommodates both narrow and wide quilts with two rail configurations. 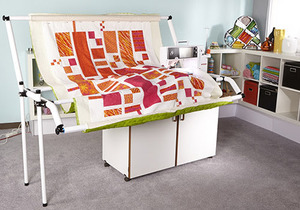 It's also perfect for free-motion quilting! 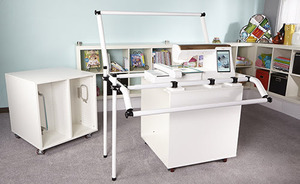 The revolutionary shortE extends the function of a regular single needle machine allowing for the creation of quilts which previously could only be achieved by those with a traditional long arm machine. 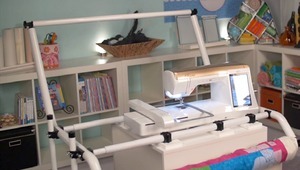 The shortE is a compact frame system that holds bulky quilts out of the way and offers a unique experience for creating continuous machine embroidery designs like you've never seen from a single needle machine. *Snap Hoop Monster, Quilting Software, and Sewing Quilting Machine sold separately. machine to hold bulky quilts out of the way. The shortE is designed to work in tandem with the Snap Hoop Monster for quick and simple re-hooping right under the needle. With shortE holding the weight of the quilt and SnapHoop Monster creating the tension, quilting large quilts with a single needle machine is a breeze. Very helpful when pieces missing in the box. Representative checked with supplier and called back promptly to let me know supplier was sending missing parts. Received them quickly. I placed my order on Monday, and it arrived on Thursday. I like your site, the service is great.I only wish I was closer to your stores, I am in Canada so it is a long way off. This is not my first order from your company. Each time has taken extra effort to complete the order. Might be my understanding of the navigation of your site. Have had to change my email address this last time to complete my effort. For what ever reason I tried todo two orders on the same day. Because of the desire to have the quilt frame sent to PA and not FL needed to do two orders. Your site linked the two together. Not what I needed. Wanted the second order shipped to FL and because did not want the order for the quilt frame to be compromised didn't proceed with the second order. Probably my fault. The quilt frame was delivered to PA as requested. Because of time restraints will do the second order later when I don't have to be concerned about delivery. Saw product advertised at presentation - had watched demonstration before attending workshop. Did comparison shopping-looked for best price. However-still in box-haven't set up yet. Website easy to navigate-I especially like I can check out with Paypal. Arrived well packaged, promptly without damage to packaging.